Where will you be on October 19? Sharkwater Extinction is the activist film to see this fall. ~ Kat Dodds, Hello Cool World Founder. Sharkwater inspired significant changes in attitudes and laws around the world. “There haven’t been many movies—ever—that made a genuine impact on public policy. Sharkwater did,” says Mark Leiren-Young, author, The Killer Whale Who Changed the World. Rob followed up Sharkwater with Revolution (2012). In it, he went deeper into the ecological web that links ocean acidification to ocean survival, and ocean survival to our survival. He looked to the evolution of life, revealing that it’s not just sharks who are in jeopardy – but us. In it he cast heroes for the planet - young people who want to, and have to -- make a difference. Our collective future depends on it. 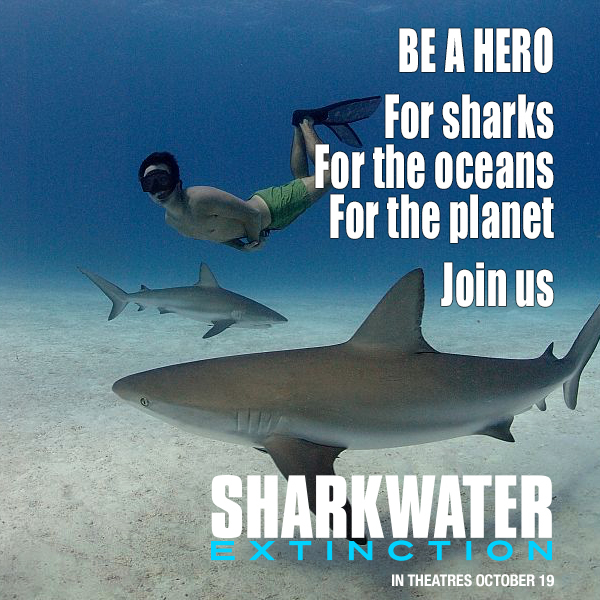 Sharkwater Extinction is now it is the activist film to see. One of the things I have found most poignant is the imagery of all these baby sharks that are needlessly being slaughtered, not only for their tiny fins, but to end up as ‘faux fish’, fraudulently mislabelled and used in all kinds of horrifying ways. We’re not sure they are in out cat food, but they very well could be. Getting information about where shark might be is difficult. But we know for a fact is sharks are being overfished and are endangered. Over the last 40 years the global shark population has dropped by an almost inconceivable 90%. In 2017, while shooting Sharkwater Extinction, Stewart tragically died while diving off the Florida Keys. Like everyone else we were devastated with the news. We lost a hero. His family and friends stepped in to complete his final film. And it’s a beautiful film. Heartbreaking and heroic, it is equal parts action film and an environmental call to action. With stunning 6K footage of Rob swimming with the sharks, prepare to amazed, but don't be devastated -- do something! It’s up to us now. That’s why Hello Cool World is so honoured to be working on grassroots outreach for this film. We want to do everything we can to get activists and everyone out to the theatre on October 19. Will you be a hero and join us? Of course we hope you will go to the film. But we are also hoping our fans and followers will do more. Get in touch to see how you can support the launch. Buy out a screening on opening weekend and use it as a fundraiser for your non-profit/charity. XO the Hello Cool World Sharkwater team!